Having seen the global healthcare creative on display at Cannes Lions Health, I think the tables have finally turned. “Brilliant” doesn’t adequately describe the work done on a worldwide scale. Whether it was Ogilvy Brazil creating a skin cancer awareness campaign that included teaching tattoo artists to diagnose the condition, or Saatchi & Saatchi of Switzerland using donated blood as ink in Vangardist Magazine’s special edition coinciding with Vienna’s Life Ball—among the world’s largest HIV/AIDS charity events—the work was truly breakthrough and inspiring. One creative idea that was so simple and yet so brilliant to me: Grey in Argentina created a hypertension campaign called “The Salt You Can See” by offering brightly colored table salt in stores, restaurants and locations during World Salt Awareness Week, so consumers could see how much sodium they were adding to their food. While I was so fired up about the great healthcare creative our industry was producing, I also left the conference slightly depressed about the work done in the United States versus in other countries. I found myself wondering why U.S. healthcare firms force agencies to create work that will sell product the next day, instead of brand-building awareness campaigns that truly disrupt the market and push healthcare forward. Is it because global efforts to eradicate preventable diseases, vaccinate children everywhere, stave off the Ebola pandemic, etc., are—in large part—made possible by donations from global pharmaceutical companies thanks to the profits from their U.S. sales? Are the short-term U.S. profit pressures just too great to accommodate long-term, market-shifting healthcare creative? It got me wondering how much longer this is sustainable. The traditional pharmaceutical model is dying. The advent of advances such as skin tattoos that measure blood sugar without a pinprick, 3D-printed bone grafts that exactly match the missing bone, and Google and Novartis’ prototype contact lenses that measure blood sugar in people with diabetes are going to rapidly crush the ability for the U.S. healthcare system to pay for expensive traditional medicine. Future healthcare companies will look more like Microsoft and Apple than Pfizer and GSK. Don’t be shocked when a “Google” acquires a company such as Johnson & Johnson to help market and distribute this new explosion of technology across the global healthcare stage. That makes my next question not “if” but “when.” When will this shift occur? When will the new model and technology explosion trickle down to the average patient in the waiting room? We’ve talked for years about electronic medical records, yet you still have to fill out a paper form every time you visit a new physician. I’m also skeptical that the traditional healthcare giants will embrace this shift and push global healthcare forward. Historically, they have embraced change at molasses-like speed, fearful that their profits will erode faster than they can replace them through new products or acquisitions. One thing is clear. The future of global healthcare is more exciting than it’s ever been in human history, and marketing agencies are going to have a vital role in connecting everyone across the globe. 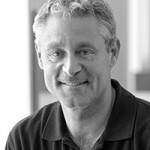 Ed Mitzen is Fingerpaint’s founder and a key member of the Strategy team, where he leverages his extensive pharma marketing experience to assemble top-notch teams for clients of all therapeutic categories and levels of organizational maturity.